Below is this month’s Newsletter, which will be winging it’s way to you very soon. All the usual news and information, but there is also a new, potential option for the redevelopment of the Aida factory on City Road. We’ve now got permission to share the promo video, so do please have a look. Comments welcome! The community centre will have a family Quiz night on Friday 5th April, which is always a good night. The last quiz was very popular, so do come along. Children welcome, and rounds for all ages! 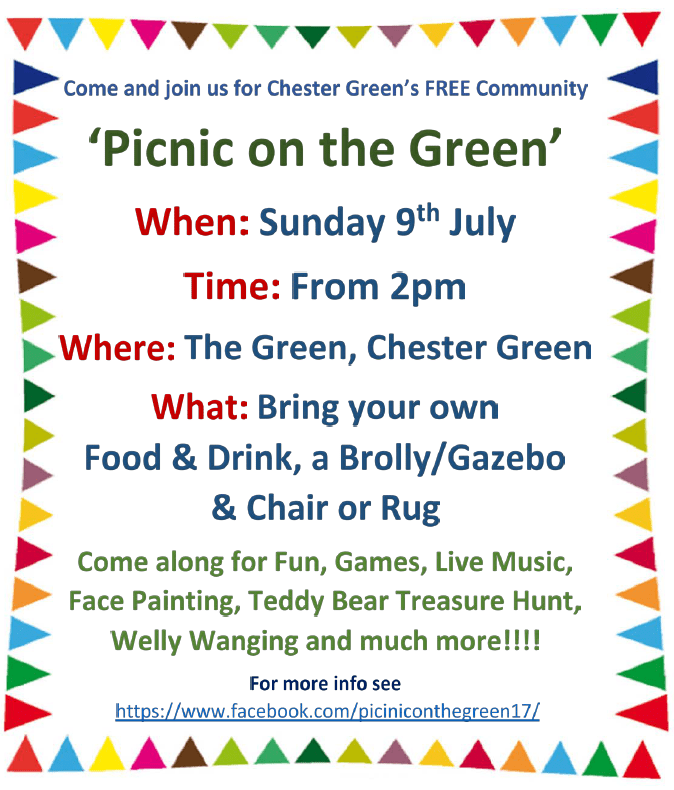 Well, it’s the month of Christmas, so here’s everything that’s going on in Chester Green over the festive period! I’ve also attached the November newsletter, as I forgot last month! We’ve got the excellent XMas window trail, where over 50 windows are taking part. Spot the XMas pudding to be put into a draw to win a prize draw. There’s the Christingle service on Sunday 2nd December at 4pm (St Paul’s) and the excellent Carol service (with live brass band….not to be missed!) on 16th December at 7pm. The Seventh-day Adventist Church also have a Carol Service on 14th December at 6.30pm. Lots of other news and info, attached below! Below is this month’s newsletter….and what an exciting month October is going to be! 6th October, there’s a circus skills workshop at the Community Centre with the awesome Chango Fuego (https://www.changofuego.com/) This is not to be missed and will be great fun for all ages! There’s also a quiz night on the 12th, and the now infamous Halloween Disco on 27th. Sunday October 7th is your last chance to visit the Little Chester Heritage Centre (open 2pm – 4pm at St. Paul’s Church). If you’ve never been, do pop in and have a look! It’ll be closed after this until April! I seem to be posting these in pairs, now! Below are the August and September Newsletters. You’ll have already received August’s, and September’s is on it’s way! Do have a look! Comments always welcome! I’m afraid I’ve taken my eye off the ball, somewhat, and forgotten to upload the last two newsletters! My apologies. You will have all received the printed copies some time ago, but here are the electronic versions! Sorry these are a bit late, but the March and April LCRA newsletters are below! This month, there’s exciting news about a community orchard, the latest on the flood defences, puppets(! ), the History Group talks, a fantastic Fashion Show (beginning of May!) and more! It’s beginning to look a bit….. 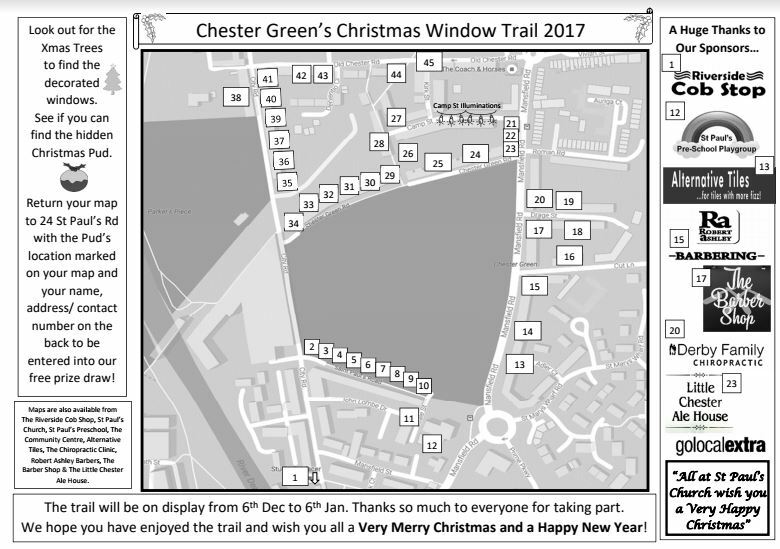 The Chester Green Christmas Window Trail will officially start from 6th December. You may have already noticed some of the windows going up in local businesses and houses, and if you find the house with the XMas Pud in the window, and return your map, you’ll be entered into a prize draw! Also, below is the newsletter which will be delivered, along with a copy of the XMas trail map, any day now. There plenty going on this month including the candle lit carol service, at St Paul’s Church on the 15th December, 6.30pm (with live brass band!). All the important info is attached below. Hope you all have a great December! LCRA October Newsletter and XMas Window Trail! Chester Green Events Team are also running the Chester Green XMas Window Trail again this year (after last year’s very successful pilot!) We had BBC Radio Derby feature us live on a morning slot and it was a great little advert for our area 🙂 If you’d like to be involved this year (you’ll be included on a little map), then do get in touch. On a more serious note, the newsletter gives updates on the Aida Bliss factory and how we’re continuing to try and convince the owners to make the building safe (as we have been doing for many months, now) and also news that the incinerator on Alfreton Road has been recommended for approval by the council planning officer, even though there are over 400 objections (although the actual planning meeting was put back for some reason). The council planning seem to be more concerned with local residents using correct materials when replacing doors and windows, and turning down extensions, than they are with dangerous buildings (allowing the Aida Bliss building to remain in its current state) and potentially air polluting waste incinerators. Is our conservation area status and council planning really fit for purpose? If you’ve had issues with the council planners, I’d like to hear from you. LCRA July (and June!) Newsletters! So, they’ll be delivered to you soon, but here’s the latest newsletter. As it looks like I forgot to post last month’s, here’s June’s too! For the latest updates, do look at the Facebook page for the event. and here’s last month’s, too, for the record!